She would slip a bit in the turns, but I couldn't run her at full throttle due to the hook in the bottom (or is it hog when the bottom is concaved), One of the reasons I decided to go full guns on the bottom is to fix that! 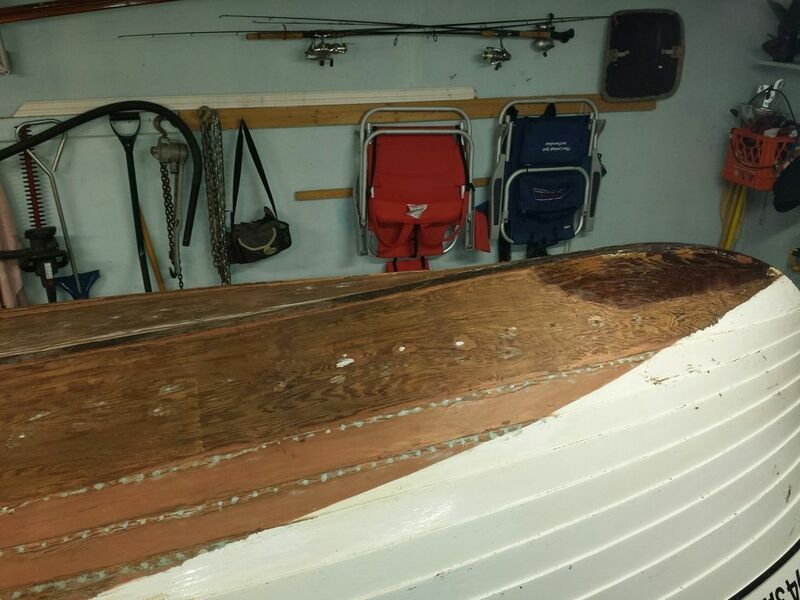 First shot is next to the garboard strake, second about half way between that spot and the keel, the third on the keel. Other side is about the same. 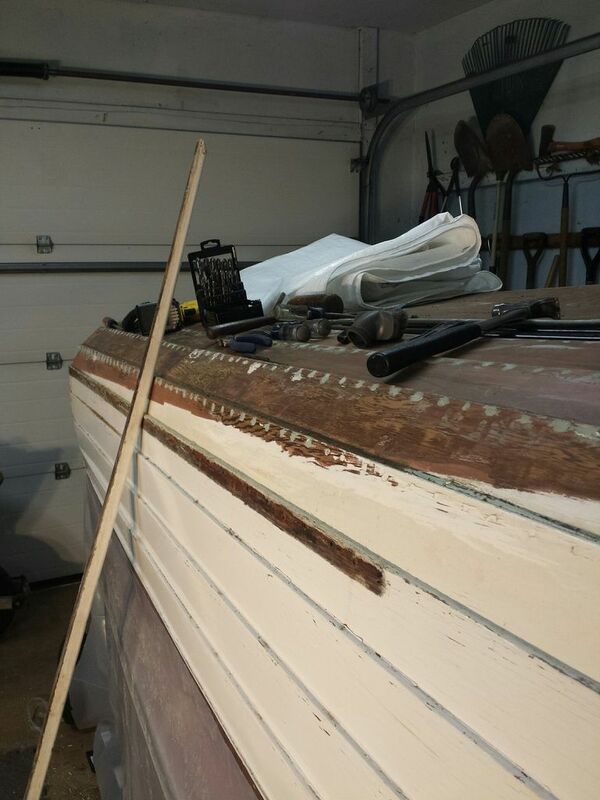 Since it is Spring in Delaware, I was able to start some paint stripping on the hull. 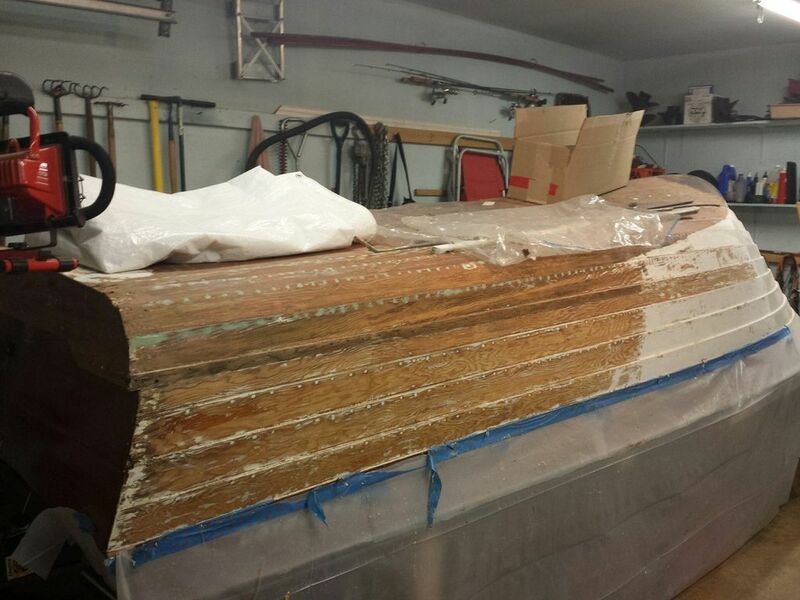 I wanted to get the garboard panels done so that I can tinker around with the approach for fairing the bottom. This stripper softens epoxy filler right up, so on the planks where I had already refilled the screw holes with epoxy I used a scraper. I'll cover these with tape when applying stripper so as to not ruin the new epoxy I laid in this summer. This is about two hours work, one coat of stripper. One more coat on the stripped areas you see here to get the last of the paint. Man o Man it is easier to work on a hull when you can sit, stand or kneel on it vs. laying on your back with stuff of all manner falling on you. Found the garboard panel scarf. All this time I just assumed that it was one long panel from stem to stern, Duh. 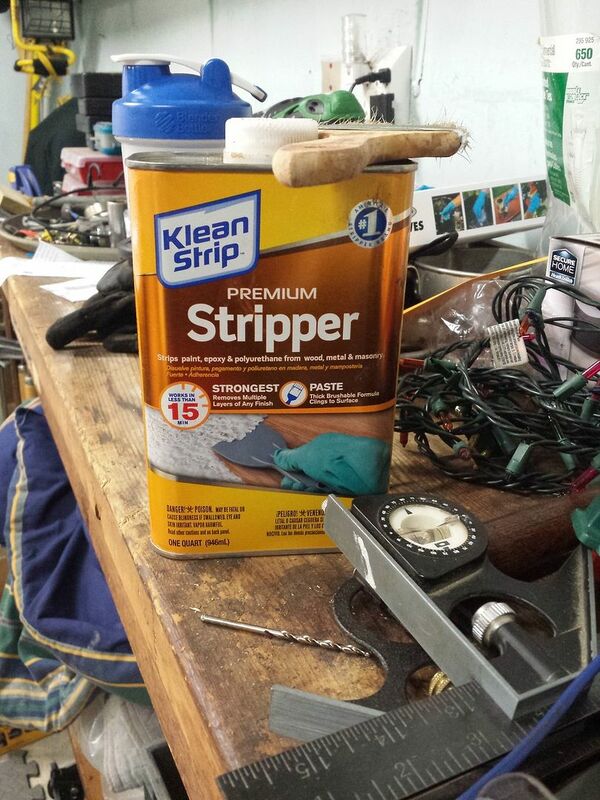 The stripper I am using. Works well enough. Anyone have a product that they prefer? 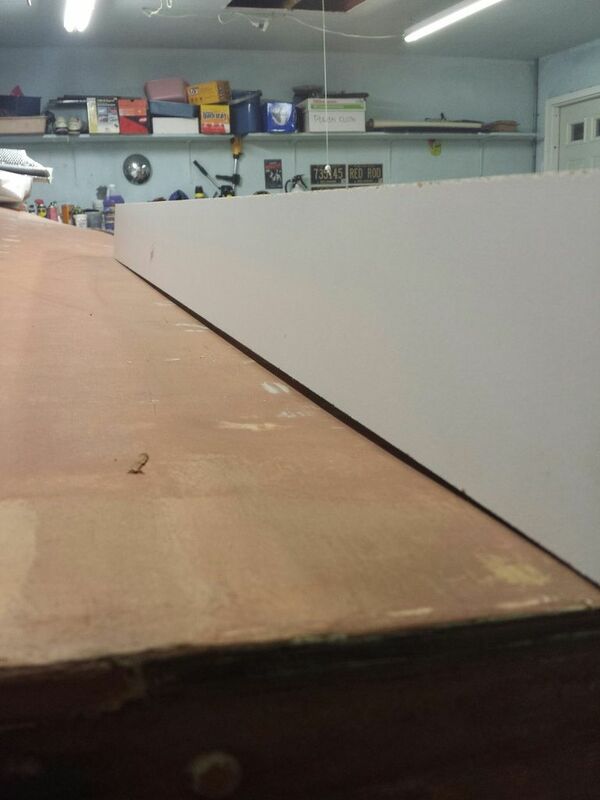 First pass at stripping the garboard panels complete, save that white section at the bow. 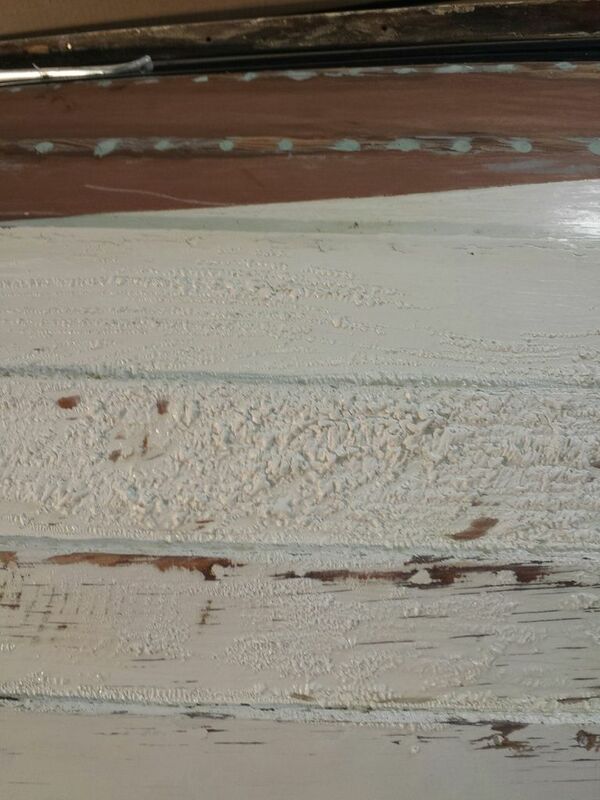 One more pass with stipper to get as much paint as possible, then sanding to get to nice clean wood. 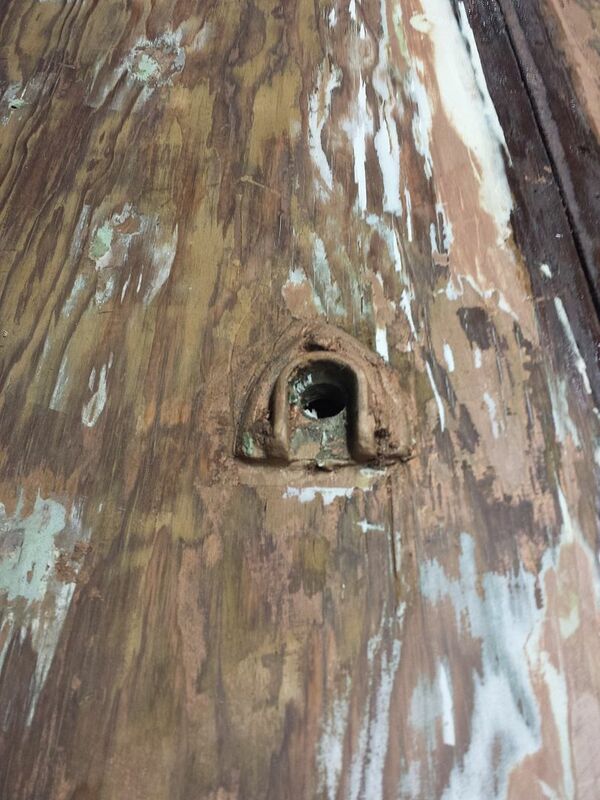 CPES won't soak in through paint. That dark section at the bow is where I spread CPES before deciding to flip and strip the entire hull. Then I'll move on to the strakes on one side, rotate the hull (all hail having it on a trailer! ), then that side. 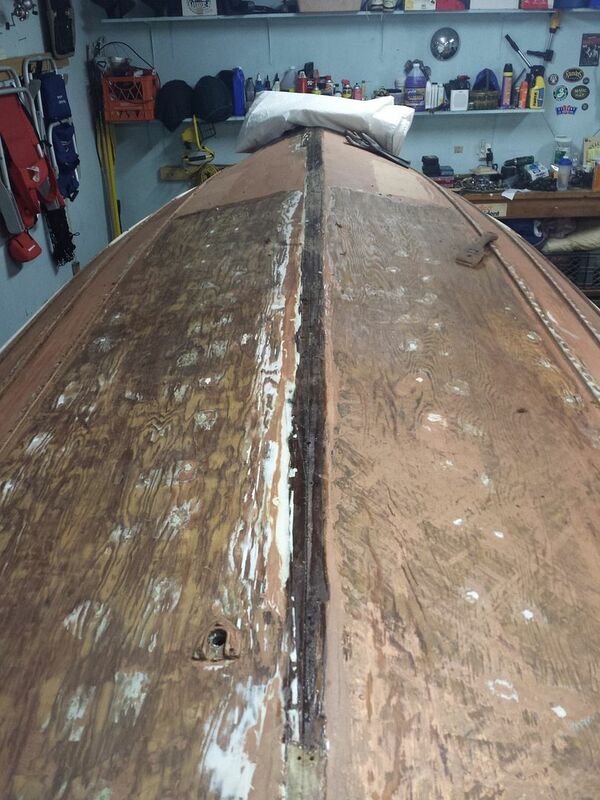 In this shot, that white at the transom is where I repaired delamination in the plywood with Smith's Fill-it. After 9 years it is still perfect. The stripper softens the filler, but then it seems to reset to hard. I'll remove as much of that as I can. Shouldn't that splash rail be varnished rather than painted? OR is that a Cortland thing opposed to the Peshtigo look? Great question. I think it was painted on that model. However when the time comes I will reference the catalog pictures that I have from the Thompson Catalog CD and either paint or varnish it. Since these pics I have removed that black trim piece (attached with small screws, so that was easy) and started on the metal trim on splash rail trim., which is attached with spiral cut nails and will be a bit of a hassle. The sheer strake I plan to just mask off and leave alone as the bright work is in great shape. It ain't broke so not gonna fix it. Spray rails on Cortland built boats were painted. Not sure when they started to do that. Red and blue were used on certain models for the spray rail. White on others. Once again Spring in January here in Delaware at 65 degrees, so took the opportunity to prep the hull for some more paint stripping. Wanted to remove the splash rail, so have to remove the metal strap to get access to the screws attaching it. It was attached with twisted nails that were very difficult to remove without damaging the Splash rail or the soft metal trim piece. 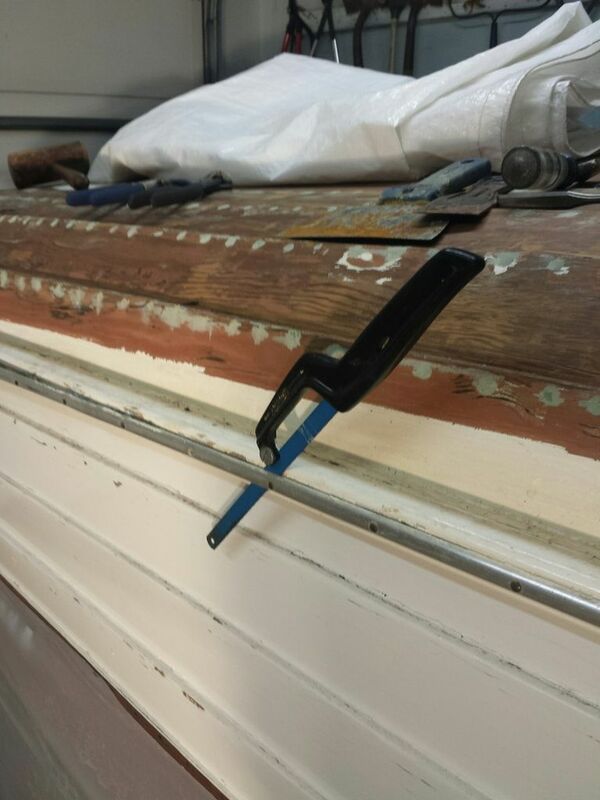 So I used a hack saw blade mounted in a special handle to cut the nails from behind the metal trim. I didn't stop to consider that this would leave the naild flush cut to the surface of the splash rail and now cant be removed. So now I cant use the same screw locations, and the trim piece is pre-drilled. I'll figure something out. Last edited by thegammas on Mon Jan 11, 2016 6:14 pm, edited 3 times in total. Ooou. Have fun with that! Stripping has been the nastiest, worst part yet. I used multible scraping tools, and da w/ 80 grit. Had to fully complete sections at a time, or mental issues might have prevented completion. Daunting, at least! But, looking back so far, it has been a blast! The part I am not looking forward to is picking/cleaning out 1000's of screw hole fillers. Fun Fun!! thought you were not going there...tried counting them and everytime came out differently. between 1300-1400, best guess. Snap-On has some great picking tools; prepare to use both hands as the cramps will occur. One row at a time...have fun! Oh, do not get too aggressive with the pick; steel as opposed to soft brass when cleaning the Phillips heads..
working my way around the boat. 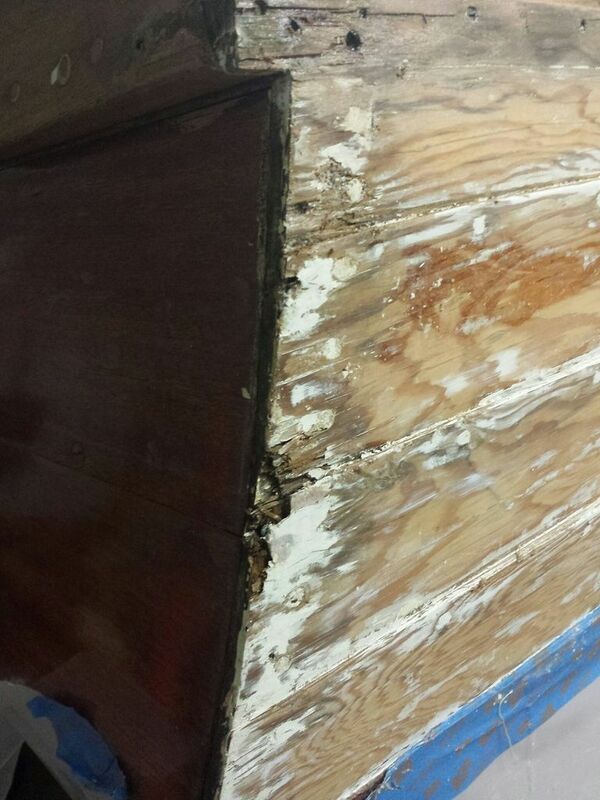 Damaged plank ends at the transom. This was covered up with a trim piece and some paint. Should be easily repaired with epoxy filler, but we shall see. 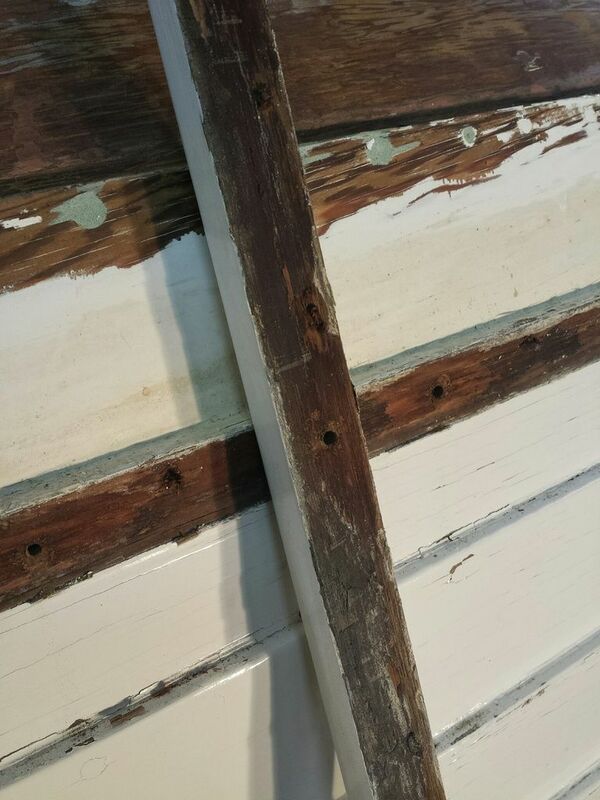 Here is a comparison of how fast the stripper works on a plank on which the paint was cut into with the stripping wheel, vs. not. 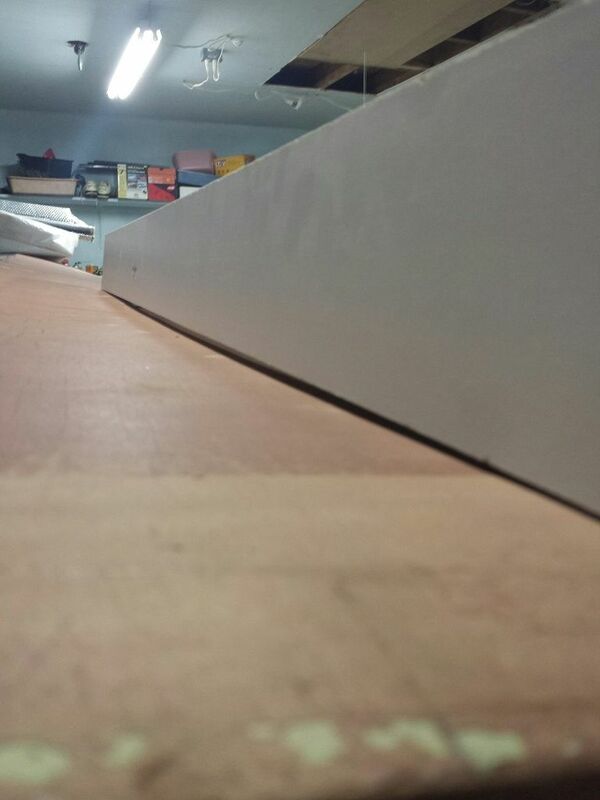 Top plank was not precut, the next plank was, then stripper applied. What you see is after 15 minutes at a temp of about 65 degrees. 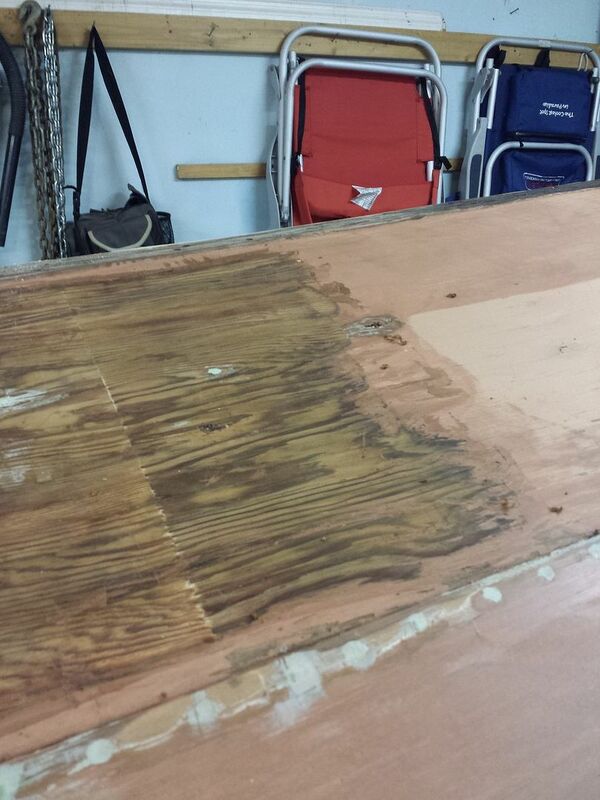 Next plank down was precut and has had one pull of the paint scrapper. 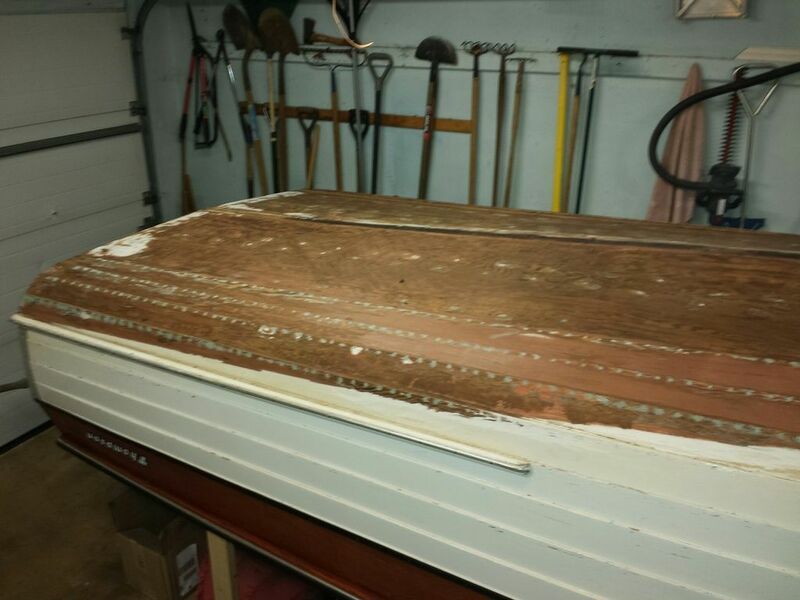 Next plank, not precut, and has had one pull of the paint scrapper. 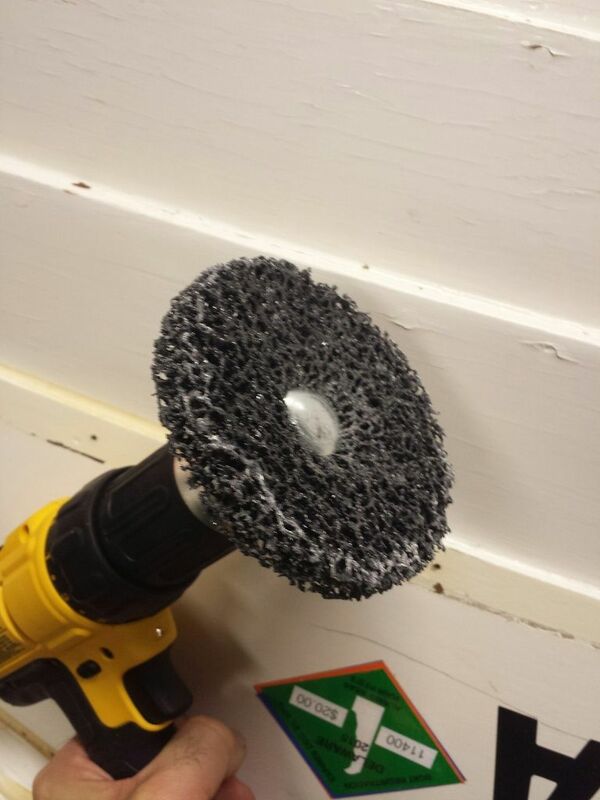 So it works better and faster to cut into the paint with the stripping wheel prior to applying stripper, However, that stripping wheel throws alot of paint chips an paint dust. Hence the goofy but essential protecto gear and a shop vac. Peter, last pic was best! Safety 1st. 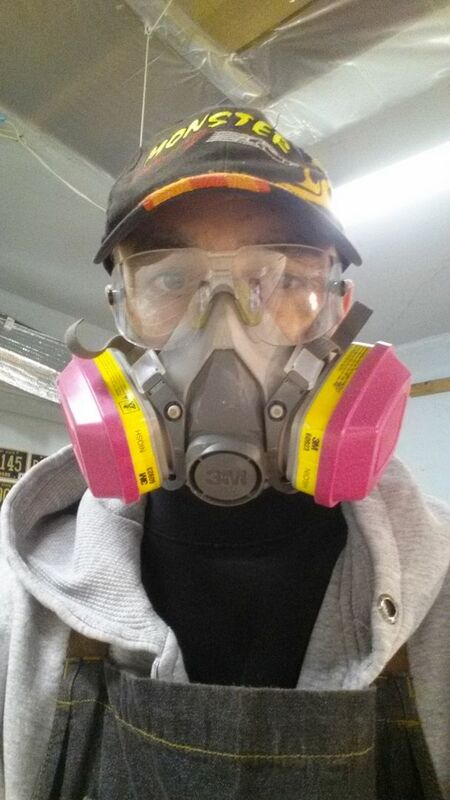 Wore the respirator and had no issues during sanding and painting. 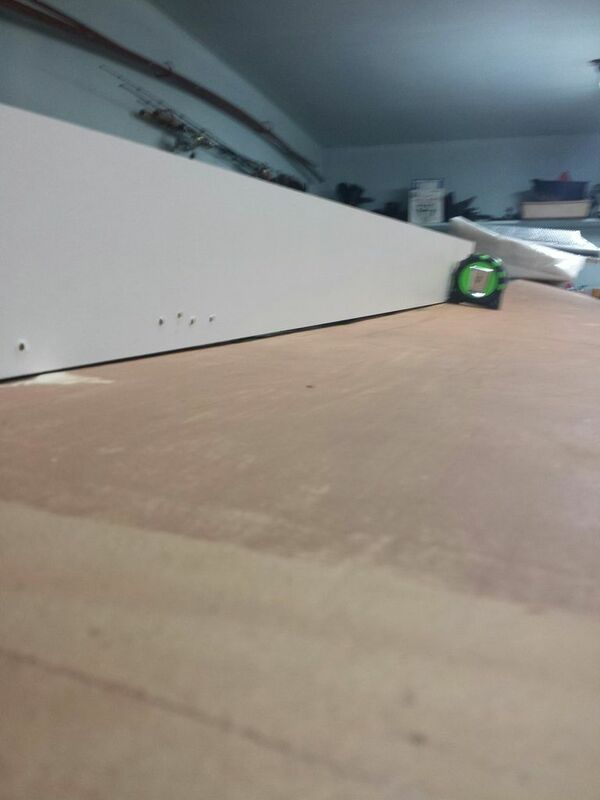 Using semi-paste stripper on the hull is slow going. Going to try a heat Gun. Thoughts anyone?